I have a secret. It’s not really a well kept secret (does that still make it a secret? ), but I like to think I’m somewhat discreet about it. Actually, to be honest, it’s not really a secret. When I say discreet, I really mean posting multiple pictures on Facebook and Instagram about it. Okay, I’m blathering on. Want to know what it is? I have an addiction to kitchen appliances. If it’s shiny, metallic, sharp, and can be used in the kitchen, I want it. If it has a motor and needs to be plugged in, I want it even more. I’m not going to admit exactly what gadgets I have (no need to face my addiction head on), but I will tell you that many kitchen drawers that were empty when I moved into my house last year have now been filled with new finds. Here is a real secret, one I’m sure you can figure out pretty easily. I don’t use all my kitchen appliances. It’s kind of like that new shirt you thought you wanted, and then bought it and wore it a couple of times, only to relegate it to the back of your closet. That’s kind of how it was with one of my biggest purchases, an outdoor grill. I spent months saving money, reading reviews, and researching the best grill to buy within my budget. After I made my decision, I “volunteered” one of my friends to help me pick it up. After I got it home, I then proceeded to let it sit in my backyard for several months without use. I only ever used it when my friends came over to grill, and then someone else was always the one doing the grilling. However, after visiting my family in Houston over Memorial Day weekend, and enjoying the yummy goodness my dad grilled for the family, I decided to utilize my grill more frequently, with pretty spectacular results. 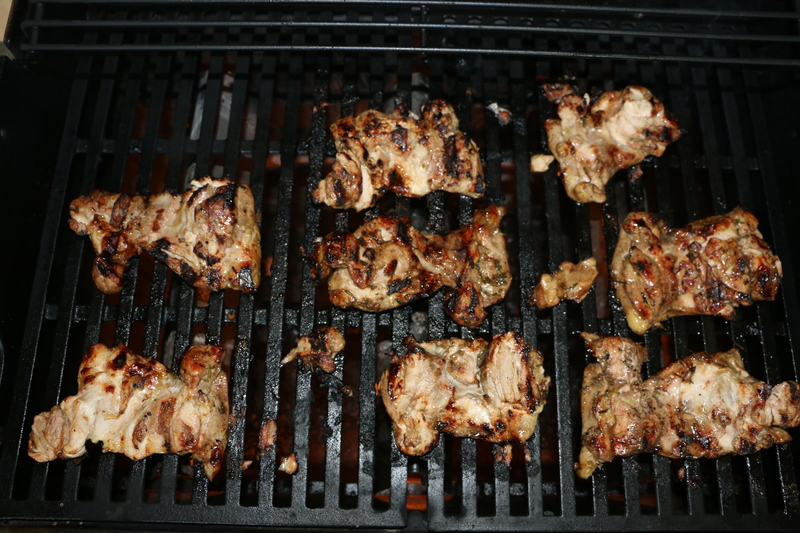 One of my favorite things to grill this summer has been marinated chicken thighs. They are flavorful, and the meat stays tender and retains its moister longer than white meat, even if you have the unfortunate experience of cooking them a little longer than intended (which I have a habit of doing). I have created a marinade for chicken that is packed with different flavors, and the salty and sweet combination is sure to make your taste buds happy. I hope you enjoy! Combine all of the ingredients other than the chicken in a large bowl, and whisk to combine. Place the chicken thighs in a resealable bag. Pour the marinade over the chicken thighs to coat. Remove as much air from the bag as possible before sealing the bag closed. Marinate the chicken thighs for at least one hour in the fridge (can marinate overnight). Once you are ready to cook the chicken, preheat the grill. 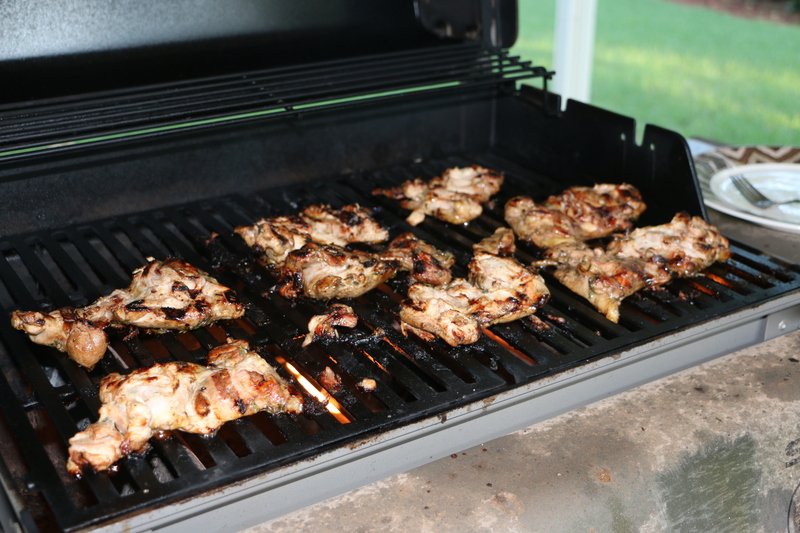 Once the grill is preheated, reduce the heat to medium low, and place the chicken thighs on the grill. Cook the chicken thighs approximately 10 to 12 minutes on each side until cooked through (the chicken should reach an internal temperature of about 180 degrees). Tags: chicken marinade, clean eating, coconut aminos, Gluten-Free, grilling, marinade, paleo, Primal | Permalink.